CD version has 2 CDs. In 1934-35 Muzio recorded a number of arias and songs for the Italian Columbia company. Columbia wouldn’t put up the money, so Lauri-Volpi and others did. Although the recordings were made when she was in declining health and past her vocal prime, they came to be regarded as uniquely expressive. Her posthumous reputation rests almost entirely on them. Yet owing to the record industry’s woes, they have become scarce. We present them in their entirety. Don Licinio Refice, who conducts the four selections written by him, composed Cecilia for Muzio, who sang the world premiere in Rome in 1934. 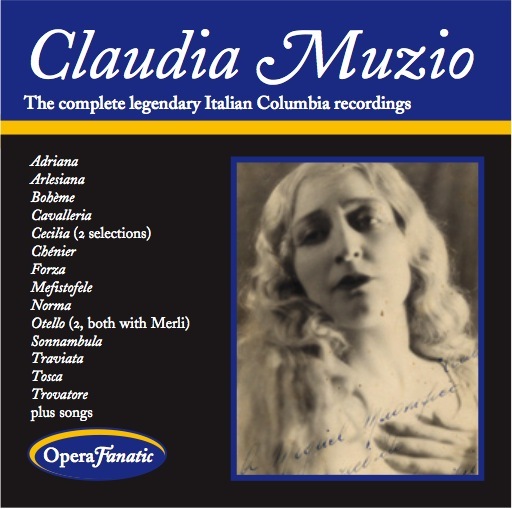 As with Ester Mazzoleni and Maria Farneti, many of Claudia Muzio’s recordings are good but not inspired, particularly recordings she made for the HMV, Pathé and Edison companies, earlier in her career. She does become impassioned on the Columbias, where the voice, however, is a little spread in pitch and her breath span is short, with phrases compromised by interruptions for breaths. Muzio pronounces “oo” with an umlaut. Would her emission have caused her to sing her name as Müzio? In “La mamma morta” she utters “il bisogno, il periglio!” with breathless urgency. She manages to imbue lots of passion into the descending portamento before “e dice.” She hums “m” and “n,” presumably to induce mask resonance. She uses chest voice lightly but takes it high, including middle-voice G-sharps on the phrase “Io son divino.” Her voice is lacking in focus. The high B is flat, yet she takes the final phrase up an octave, presumably to avoid having to sing middle-voice F-sharp and G in chest loudly or else be ineffective. Still, because of her depth of feeling, this remains among my two top choices for this aria. The other version is by Gilda Dalla Rizza. In “Poveri fiori” Muzio’s short breath span causes her to take too fast a tempo. Magda Olivero’s span is longer. Muzio is more mature-sounding even than late Olivero—more Magnani-ish. Olivero does more with the words and accentuates the individual words more: “bacio di morte.” And yet she manages not to make the melody sound choppy. Muzio is blander. She interprets less, inflects less and has less emotional intensity. Syllable by syllable there’s more emotional tension in Olivero’s versions. In “Voi lo sapete” Muzio’s breath support is so-so. Note the glottal attack on the second high A (“Ah!”). Voice teachers before her time would have condemned such a thing, yet Farneti and, to a degree, Olivero sang this way. Muzio does sing the aria with passion. In “L’altra notte” she is full of feeling but has no trill. In “Sì, mi chiamano Mimì,” from the middle of the staff on up, she darkens vowels and even puts an umlaut on “eh.” Many notes have tiny scoops. When she changes syllables it frequently takes a moment for the new note to establish pitch. She breathes on the high As, breaking the phrase. Muzio conveys a nice breathless feeling on “Germoglia.” Yet hers is a mature-sounding Mimì. Muzio and Rosa Ponselle were among the first women to darken and cover their sounds, in the manner of most modern singers. They sound older than their chronological ages, no doubt because of it. On her HMV recordings from 1911, Muzio does not darken or cover. She recorded “Sì, mi chiamano Mimì” in 1911, 1917, 1921 and 1935. Comparing the four recordings or, better still, her recordings in general across the years can help us understand these major developments in the history of singing. As for Muzio’s “Ombra di nube”—sometimes it makes me cry.